Until it closed recently, Rosie’s Bakery was a local Cambridge institution, offering unapologetically rich, sweet baked goods. Chef-owner Judy Rosenberg published a number of cookbooks over the years, and this recipe comes from The Rosie’s Bakery All-Butter, Cream-Filled, Sugar-Packed Baking Book (Workman, 2011). Rosenberg has a whole series of brownie-based treats, all of which start with (the batter for) her “Rosie’s Award-Winning Brownies” and then add other flavors, textures, toppings, bottom crusts, etc., to achieve different effects. The recipe I chose to make, “Peanut Butter Topped Brownies” (p. 263) adds a layer of sweet peanut-butter frosting, a chocolate glaze, and chopped peanuts to the basic brownie recipe — doubling the calorie toll for sure, but adding a lot of flavor and texture, to the extent that some tasters weren’t sure if they really qualified as “proper” brownies at all. The basic brownie recipe starts with 6 oz of unsweetened chocolate (again, I used TCHO 99% dark chocolate critters) along with butter, sugar, vanilla, flour, and four eggs. (I believe this is the only recipe to be baked in an 8×8 pan that uses four whole eggs.) The master recipe allows for walnuts as an option, but since I was making the peanut-butter variant, I left them out (better to stick to one kind of nut). Construction proceeds by procedure #1 (as outlined in part 2 of this series), and the brownies are baked for a fairly long time (it took 38 minutes in my oven, longer even than called for). 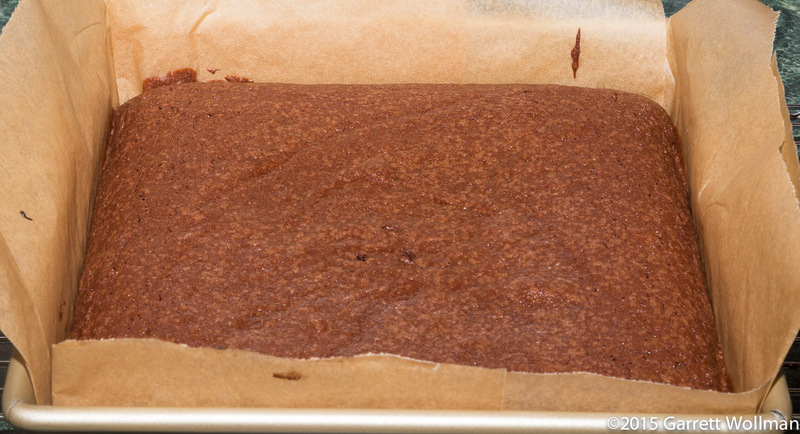 The brownies must cool completely in the pan before the next layer is applied, as the heat would otherwise melt the frosting. 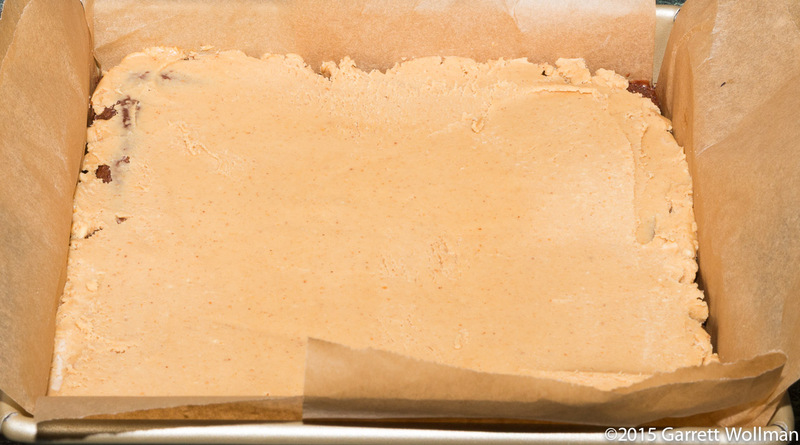 That frosting consists of peanut butter, butter-butter, vanilla, and a whole cup (120 g) of confectioner’s sugar. I found that with my peanut butter (locally-made, all-natural Teddie brand, with no added oil or shortening) that the frosting was much too thick, well beyond spreadability, and ended up adding a few additional tablespoons of peanut butter to loosen it up; the nutrition data below reflect the peanut butter I used. The frosted brownies are then placed in the freezer to solidify the frosting before the next stage. After freezing for an hour, it’s time to apply the last two stages of topping. First is a chocolate glaze, made from corn syrup and melted bittersweet chocolate — having run out of the TCHO 66% dark chocolate discs, I chopped up some Valrhona Caraibe for this. On top of the glaze, I added the optional chopped peanuts — this serves as a visual warning to reinforce to potential eaters that peanuts are present. Full disclosure: I loved these, even though they were very sweet and not as chocolatey as one might like in a brownie. If only they weren’t so high-calorie, this is the sort of thing I could eat all day! They reminded me of the sort of things my mother wouldn’t let me have when I was little. Although the sample size was fairly small (n=3), the tasters seem to have agreed, ranking these second on “overall impression” with a 4.5 (on a 1–5 scale), scoring 4.3 on “moistness/mouth feel” and “topping”, 4.0 on “chocolate flavor”, and 3.3 on “chewiness”. One taster gave a “favorite” to this recipe. 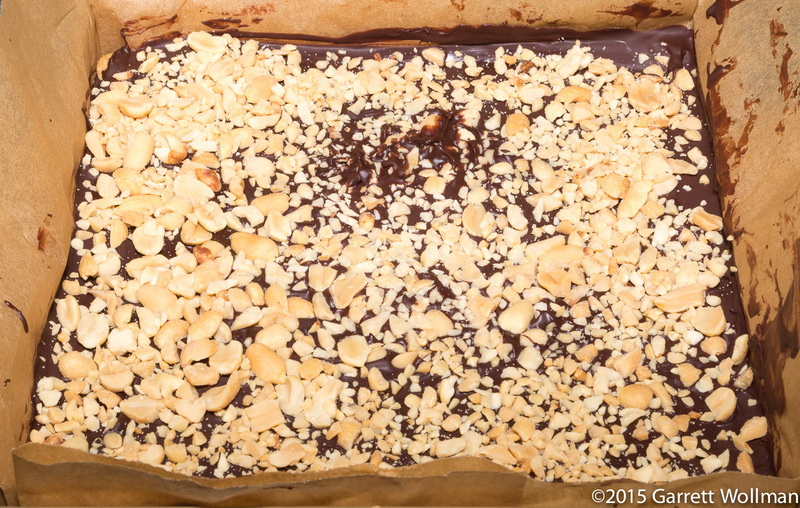 This entry was posted in Food and tagged browniefest, brownies, chocolate, Judy Rosenberg, recipe, Rosie's. Bookmark the permalink.